Major General Jarken Gamlin called on Speaker L.A Er T.N Thongdok on 11th June, 2018 in his office at State Legislative Assembly. 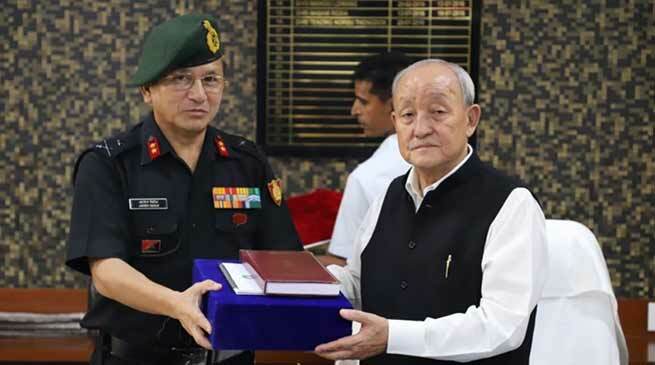 The Major General Jarken Gamlin expressed his keen interest in the Governor Brig (Rtd) Dr B.D Mishra’s initiative of constituting a “PAY BACK TO SOCIETY GROUP” by all officers serving in armed forces in order to motivate and guide the youths of Arunachal Pradesh in joining Indian Defence services which at present is very few compare to other States in the country. The Speaker L.A, Er T.N Thongdok welcomed and appreciated Major Gen Jarken Gamlin’s joining in the efforts of the Governor Brig (Rtd) Dr B.D Mishra’s initiation for enrolment of youths of Arunachal Pradesh in the Defence services specially in the armed forces and Major Gen Gamlin’s involvement would be a huge support to him in creating platform in motivating the youths. He also said that the Governor Brig (Rtd) Dr B.D Mishra is in constant touch with him on this issue and strongly feel that our youths once in defence service under the regimental discipline and indoctrination of service before self will surely make our youths self reliant and infuse feeling of patriotism. Major General Jarken Gamlin desired government intervention wherever necessary in the endeavour of PAY BACK TO SOCIETY GROUP to which the Speaker expresses his willingness to support even from his MLALAD fund in organising various motivating camps such as Army recruitment rallies which the Governor Brig (Rtd) Dr B.D Mishra has already started in various districts in the state.